Global commerical real estate services company CBRE Korea, announced that the domestic commercial real estate investment market remained active in the first quater, with 42 deals complete across all sectors, representing a transaction volume of 2.4 trillion won (USD$2.2 billion*), an increase of 179% y-o-y and a slight decline of 8.2% q-o-q according to CBRE Korea's "Q1 MarketView" report. The K-TWIN Towers sold for record high unit price of 28 million won per pyeong. Domestic investors' prefer safe assets, foreign investors following value-added strategies. Most notably, The K-TWIN Towers property was sold for the highest ever unit price for an office assest in Korea, at KRW 28 million won per pyeong (USD$25,921.73* per pyeong). In the office market sector, average effective rents increased by 0.6% q-o-q due to an increase in relocation and expansion demand from industries including technology, finance and co-working. 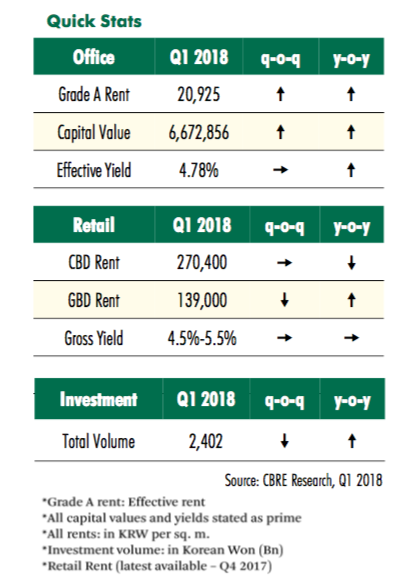 Overall vacancy also increased by 0.5%-points q-o-q reaching 11.1%, driven largely by a hike in the Yeouido Business District (YBD). “In the retail sector, F&B retailers continued to demonstrate steady leasing demand while Gangnam Station has emerged as a sports fashion retail hub for several flagship stores. In the logistics sector, the Yongin and Icheon areas have shown continuous demand,” remarked Claire Choi, Head of Research. Average effective Grade A office rents in Seoul increased by 0.6% q-o-q to KRW 20,925 per sq. m. Although tenant incentives were flat, increases in face rents led to a marginal increase in effective rents. The average vacancy rate in the Seoul Grade A office rose by 0.5%-points q-o-q to 11.1%, and an increase in vacancies in Yeouido contributed the most. The Gangnam area continues to act as a hub for local and international sports fashion retailers. UK-based sports fashion retailer JD Sports opened up its first Korean store in Gangnam and plans to expand to 21 stores across the country by end of this year. In addition, the entrance of U.S.-based Blue Bottle Coffee planned for Q2 2018 is creating buzz within the retail sector. Leasing demand for logistics centres by third-party logistics firms and manufacturers was solid. Local e-commerce player Ticket Monster is planning to develop its second logistics centre, this one of about 36,000 sq. m., due to increasing demand from the rapidly growing fresh food and daily goods market. In addition, several major investment transactions happened in the Icheon area, including Logiport Icheon, the DSL Logistics Centre and Dongsan Logistics Centre. Total investment transaction volume in domestic commercial real estate was 2.4 trillion won (USD$2.2 billion*), a slight decline of 8.2% q-o-q with 42 deals closed. The K-TWIN Towers, which are located in Gwanghwamun, hit the highest ever unit price for an office asset in Seoul at KRW 28 million won per pyeong (USD$ 25,921.73* per pyeong) due to minimal vacancy levels and its strong tenancy list. The K-TWIN Towers property was acquired by Samsung SRA which shows local investors are willing to adopt an aggressive stance toward well-located Grade A office assets with stable tenancies, while foreign buyers have a different approach in acquiring Grade B office assets and enhancing their value. Furthermore, Angelo, Gordon & Co. acquired the KB Bank Building in Myeongdong, which it is considering converting into a hotel and retail mixed-use property, leveraging its location in an area popular with shoppers and tourists. For additional information or to disucss the report email Claire Choi via the contact detials listed below. *USD figures are approximate, and as of 26/4/2018.